In the world of Red Son, Superman was found and adopted in the Ukraine, not Kansas, and so grew up as a tool of the USSR rather than the USA. In this world, Superman's enemies and allies have developed differently - though still recognizably. Who's that guy in the gray suit with the black trim? It's Batman! Batman uses a form of radical brain surgery to turn rebels into calm and compliant believers in his party. Hey, look, major error right on the card! Always love that. Superman is the one turning people into robots - Batman is fighting against it. When he was a young boy (his true name is never given in the story), Batman's parents were gunned down. But this time it wasn't some random mugger holding the gun, it was Pyotr Roslov, Chief of Police; the couple was shot for publishing dissident anti-Superman propaganda. Now an adult, Batman leads a terrorist network opposed to Superman's rule. The sculpt is very nice. Batman isn't impervious to the weather, as Superman and Wonder Woman are, so he can't prance about a Russian winter in skin-tight spandex. He's wearing bulky, padded clothes - a big jacket and thick ski pants. Even his cowl has been winterized, with a fur-lined flap folded up above his big, scowly jaw. 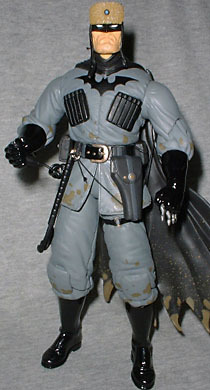 The small sculpted details convey the weight of his clothes, and the pouches of his utility belt look real. His cape is tattered and aged. The bat symbol on his chest is a raised element, and you can see the big, rough stitches holding the pointy little ears to his hat. That does raise an interesting question, though: why a bat? In this world, this alternate reality, why a bat? In the normal world, a bat flew through his window and inspired him to similarly terrorize the underworld. But in Russia? Why a cape? Why the ears? Why a symbol on the chest? The original Batman dressed like a bat - this guy dresses like Batman. DC Direct has had some problems with its paint apps, but Red Son Batman looks great. It is a simple costume - all black and gray - but the paint lines are crisp, and there's more to it than is obvious at a glance. His belt buckle has a faded gold veneer and the clasps on his uniform get an app. You can tell Batman has been living rough, because he's got a really subtle five o'clock shadow and mud splatters on the lower half of his pants and cape. Articulation is good but, as usual, not overly impressive. Bruce Waynovitch moves at the knees, hips, gloves, elbows, shoulders and neck. The head and shoulders are balljointed, and you gotta love that, but with this coat, there's no excuse for him not having a waist. Just tuck it up under the flaps and no one would ever see. Batman has a small selection of accessories, but to be honest, none of them really bring a lot of playability. There's the Elseworlds base that all the figures in this series have: a black and red version of the logo. It's nice, but almost not worth mentioning. It's expected. His left hand is sculpted as a fist, and he's toting a set of wicked spiked knuckles - but they're sculped in place, so no counting them. Ditto the holstered gun on his belt. Instead of a batarang, he's got a bat-shaped ice pick. I'm sure it works great as a grapple, but he can't hold it - the figure's right hand is sculpted to hold something, but the batpick has a metal ring on the end that won't fit between the thumb and fingers, so it's relegated to hanging from the other metal loop on his belt. So if the hand is sculpted to hold something, but it can't hold the pick, what good is it? Well, he's holding something in the package - a detonator. A coiled cord connects the switch permanently to his belt. How can you tell Red Son is an Elseworlds story? Because of all the times Superman and Batman have fought, it's the only time Superman won. As far as redesigns go, Red Son Batman is pretty cool. He makes sense in the world of his story, and the redesign has the right combination of the exotic and the familiar - provided you don't think too hard about what you're seeing. Even if you don't dig Red Son, this Batman might just deserve a spot in your collection based on looks alone. What's your favorite Elseworlds take on Batman? Tell us on our message board, The Loafing Lounge.